Ruark Audio MR1 review | What Hi-Fi? If we were judging on looks alone, the Ruark MR1 speakers would ace it. 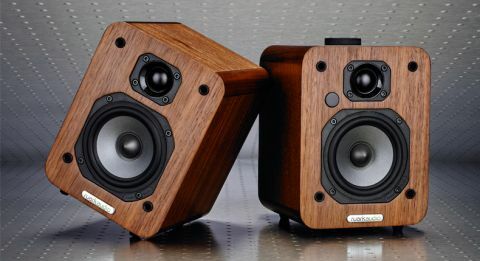 All walnut veneer panels (black and white lacquer finishes are also available), metal fittings and fine mesh grilles, the design is one that fans of the Ruark Audio brand will recognise from the R1 MkII radio. They’re just slightly bigger than what we deemed the ‘perfect desktop size’ in the Monitor Audio Airstream WS100, but they’re far from the rather unwieldy size of the Epoz Aktimate Micro. We certainly can’t see there being a problem finding a place for the MR1 speakers on your desk or shelf – and we’d actively shift a few things around to make room for them if there was. There are a few added extras of note in the Ruark MR1s. Bluetooth is on board with aptX support for clearer playback and there’s the option to attach the £50 wireless battery pack designed for the R1 radio, too. This makes them an entirely wireless stereo solution. They’re simply fantastic to listen to. The amount of detail delivered by the Ruark MR1s is staggering. The layers of harmonies around a note – be it a piano key or guitar strings – are articulately conveyed, with notes stopping and starting with precision. What we love most is just how dynamic and subtle they are. Songs flow fluidly, with rhythm changes and dynamic upheavals handled with confidence and agility in an airy soundfield. It’s a captivating performance that draws you in and never lets you go. Voices are clear and expressive. Tom Waits’s growling, rumbling tones are packed with character and intensity in God’s Away on Business, while the high notes in Neutral Milk Hotel’s In The Aeroplane Over The Sea are melodic and have just the right amount of bite without ever sounding shrill. Every vocal nuance is laid bare, and you’ll find yourself playing your Spotify or Tidal playlist for hours without ever tiring of listening to these speakers. While it’s not the biggest and bassiest of sounds, the Ruarks are deft at delivering all the textures and rumbles in the low-end frequency, although KEF's Egg music system has an eloquence in that area that not even these MR1s can muster. It’s a satisfyingly nimble and energetic performance, although we would experiment with placing the speakers close up against a wall to add some heft to the bass. On the back of the master speaker (the right-hand one) you’ll find the line-in input and a subwoofer out. There’s also an attenuation switch, which allows for a range of more high-powered audio devices – including TVs or CD players – to be hooked up to the MR1s, giving them a more flexible usage. The right-hand speaker also holds the volume dial, which doubles up as a power and input switch. Short presses turn the unit on or off, while a long press will toggle the input between line-in and Bluetooth. You’ll be able to tell which input is in use via the multi-coloured LED near the dial. There’s a simple and effective remote control, too. If you forget to turn the MR1s off, they slip into sleep mode after a period of inactivity, and those hooked up to TVs are clever enough to turn on and off with the TV. Unlike many rivals, the Ruark MR1s flex their hi-fi muscles with the more traditional Class A/B amplification rather than class-D. There are two new drive units too, developed specifically, says Ruark, to maximise the sound possibility from small cabinets. The MR1s contain 7.5cm mid/bass range drivers and 20mm tweeters, each featuring their own neodymium magnet system for better driver control. The Ruark MR1s are a fantastic pair of speakers. There have been newer models that take the fight to these compact speakers with bigger sound and greater connectivity, but we’ve yet to come across any rival that delivers a more engaging, detailed and dynamic sound. We think you’ll like them just as much as we do.